Every so often, I get these promotions from Overnight Prints and / or Vista Prints for 50 or 100 free postcards. So I try to whip up a new Spookytown and take advantage of the deals. Here is the latest one I created. I should have some more stuff to show in a few weeks. I am still hard at work on the book. I'm doing something each day on it. Lately that hasn't been much, but it's been something, which is better than nothing. I like the new layout, Cal. So what IS Spookytown about? Also, I've heard Vista Print is pretty cool with making business cards, but they have this huge watermark, or something like that. Are they pretty reliable and okay to use? Love the design, Cal! Can't wait for the graphic novel! I don't know about VistaPrints, I haven't gotten them in the mail yet. Hope they're okay, I'll definitely post about it when they come in. NICE! 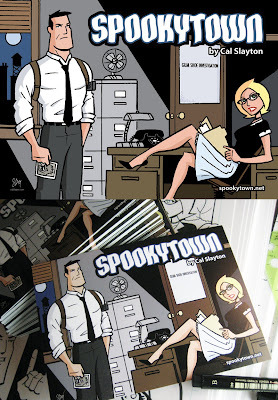 any Spookytown news is GOOD news!